These ones are a combination of a fixed bridge and a removable prosthesis. It is necessary in such cases where the disperal of the tooth loss has already reached an extent in which the force exercised by chewing and biting is very burdening for the still remaining teeth. Mostly cases are typical in which the patient still has incisors in the front, but a lot of molars are already missing. In such cases ceramic crowns are prepared for the remaining natural teeth,which are bonded fix, in which links – anchors, attachments – are worked into. 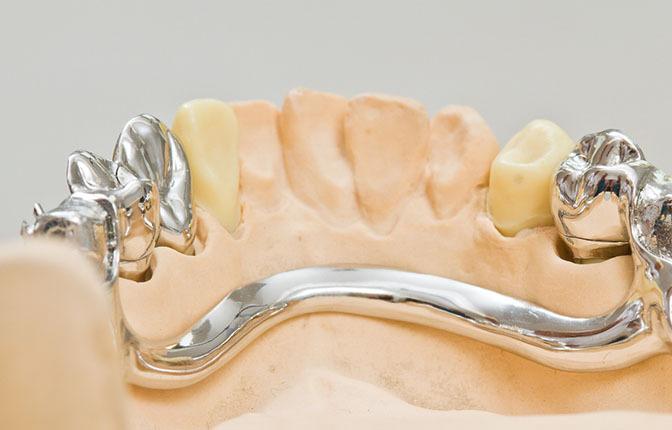 With the aid of these links the removable prosthesis is connected with the residual set of teeth. One part of the press stud is at the end of the bridge, the other is fixed on the denture. If the denture is put in its place, the anchorage can’t be seen.